These Flight Test Gauges are capable of displaying more than 30 different engine and aircraft flight parameters. They can also record flight data to a text file for post-flight analysis. Download the CFS1 version of the Flight Test Gauge (29k) Download It! The FS2000/CFS2 Flight Test Gauge Set includes piston and turbojet versions of the Flight Test Gauge and panel configuration files for both. Test Panel bitmap and panel configuration files (320k) Download It! The FS2000/CFS2 Flight Test Gauge Set includes piston and turbojet parameter displays all in the same Flight Test Gauge . This version will also display a selected subset of parameters in metric units. Panel configuration files included. Test Panel bitmap and panel configuration files (120k) Download It! The 32-bit FS2004/FSX/P3D Flight Test Gauge Set includes piston and turbojet parameter displays all in the same Flight Test Gauge. Also included are the new Mudpond Climb Rate Test Gauge, Runway Test Gauge, and Autopilot. Click on each picture below to read the user guide for each new gauge. The user guides, a panel background file and panel configuration file are included in the zip. Test Panel bitmap and panel configuration files (500k) Download It! The 64-bit Flight Test Gauge Set contains the Mudpond Flight Test Gauges recompiled in 64-bit DLL format for use in P3Dv4. 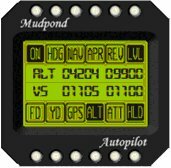 The Mudpond Flight Test, Climb Rate, Runway, and Autopilot gauges are included with user guides, a panel background file and a panel configuration file. 64-bit Mudpond Flight Test Panel (668k) Download It!